Fishermen and children worked off the coast of Senegal. In the course of the day, the Atlantic Ocean off Senegal’s coast, golden in the rising sun, becomes turquoise, then green, then deep blue. An offshore wind rises in the afternoon, shatters the blue into a myriad black diamonds. One day in November, a wooden pirogue bobbed on such a sparkling sea. Inside the pirogue, on a thwart, a child slept. Oumar Kane was 12 years old, the 10th and youngest son of a fisherman. The pirogue, the Khady Sarr, bore his mother’s name. The Khady Sarr was part of a flotilla of two: a purse-seiner crewed mostly by strong young men who cast and hauled the heavy net, and her catch boat — a typically lightly-manned receptacle to carry the fish to harbor. The Khady Sarr was the catch boat, crewed by Oumar and his cousin, a 23-year-old who had never gone fishing before. The tandem had left port early, aiming to return by dinnertime. Fifteen nautical miles offshore, the catch boat’s motor malfunctioned. The purse-seiner’s captain told the cousins to drop anchor and wait for his return while he caught some sardines. A few hours, max. But the captain’s GPS recorded incorrectly the Khady Sarr’s coordinates. The cold woke Oumar. It was night, the wind blew raw. His cousin, too, shivered awake. In the dark, the ocean bled black into endless starry sky. There was a search, brief — because the fishermen who organized it were too poor to buy fuel — and unsuccessful. Oumar’s mother knelt on the refuse-strewn shore in Joal, the boy’s hometown, trying to stare her son and nephew out of the horizon. Three days and two nights after they had been abandoned at sea, the cousins — scared, hungry, alive — were towed to shore by a fisherman who accidentally had run across the Khady Sarr. 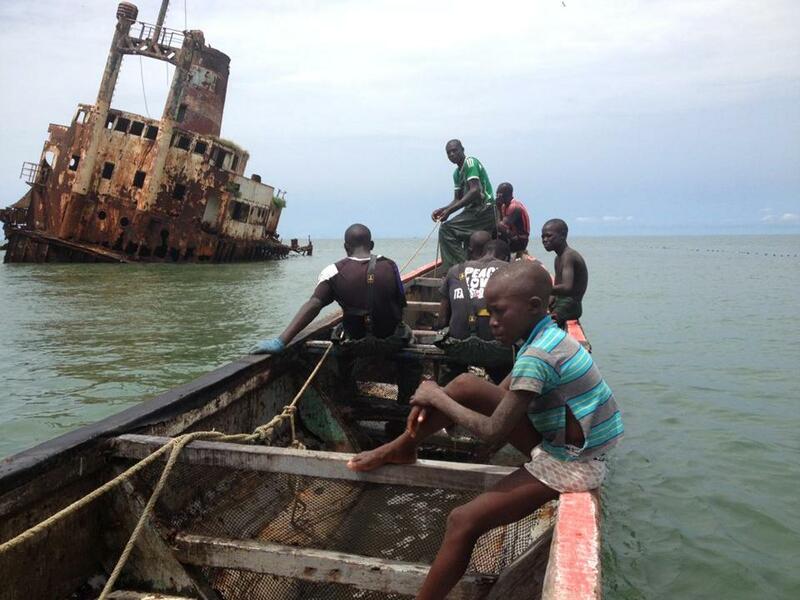 A few weeks after their rescue, Oumar headed back out to sea. I visited Oumar in early February, the week Europe announced that it had somehow misplaced 10,000 child migrants who had arrived on the continent unaccompanied to seek asylum in the last two years, mostly from the Middle East and Central Asia, some from Africa. That morning, Oumar had just returned from a night of fishing, and he was trying to get some shut-eye on top of a scrunched-up bed sheet on the linoleum floor of his parents’ room. He was naked apart from a pair of gym shorts and a rope gris-gris belt, and he was using his mother’s yellow dress as a blanket. She pulled the dress off her boy — “Wake up, baby, you have visitors!”—and apologized that he was being such a sleepyhead. He would go fishing again that evening, she explained. “The sea,” she said, “is all he knows.” Oumar’s father sat on the marital bed, smoking a cigarette and nuzzling a 4-month-old grandson. Two enormous pink blisters scarred the infant’s back, where a few days earlier a relative had accidentally spilled boiling tea. Joal is the largest artisanal fishing port in Senegal. One way or another, everyone here takes part in the industry. They start young. Ten-year-olds haul nets. Most of Senegal’s catch remains in West Africa, but about 40 percent is exported to Western countries. Joal’s children may be putting some of the seafood on your plates. Senegal has one of the region’s lowest child mortality rates, though many families here have lost at least one child. One of the fishermen has lost three. Yet no statistics can tally the deep and ancient vulnerability that underlies the mangled dailyness of the lives of Joal’s children when they are not working or dying. Their parents hold them very dear. Mothers carry them on their backs and nurse them for the first two years of their lives. They buy them used stuffed animals discarded by Western children and imported in bulk, and launder them in bleach to kill germs. Simply, children in Joal are born into a grown-up world indifferent to their age. Why this matters is not a question of geopolitics but of morality. In our increasingly globalized world, where one in seven people is on the move, some of these children may one day become your children’s girlfriends, teachers, grocers, legislators. They are your children. To acknowledge their nontelegenic withering requires overcoming entrenched disinterest that both originates from and conditions the planetary-scale imbalance of power. It requires stretching the customary boundaries of empathy, of imagination. The writer Annie Dillard once proposed this method: “There are 1,198,500,000 people alive now in China. To get a feel for what that means, simply take yourself — in all your singularity, importance, complexity, and love—and multiply by 1,198,500,000.” It is difficult. It is a start. Only from this moral place can the West begin to contemplate actions. How and where it invests its riches. Whether shoring up the abattoir of the Middle East is more essential than alleviating the less visible yet more endemic abscess of poverty. Whether the isolationist fortification of borders against the millions of people in pursuit of life and dignity is sensible, let alone sustainable. A week after the world learned that 10,000 child migrants have vanished in Europe, Joal celebrated City Day. At noon, tween majorettes began to whirl to a loud and immemorial African drumbeat down the main street filled with smoke from the fish-processing factories. They wore short, pea-green dresses and white socks but no shoes. Folks came out to watch the girls’ earnest effort, their faces rigid with concentration, their endearing botched synchronicity. Because it was Sunday and no school and little work — but also because they were enraptured — Joal’s children followed the majorettes up the street, twirling, stomping their own often unshod feet to mimic the performance. Maybe Oumar was among them. Maybe he was at sea, or asleep. As the majorettes danced northward, the side streets and alleys emptied of kids. In a way, they were already missing: They were among the millions of Earth’s truly invisible children who simply get sluiced away into premature adulthood or death without the world noticing, flicked away like crumbs, inglorious, unsung. The world has misplaced them. In such a town, with its medieval social architectonics, a pied piper could succeed, could sweep all the children there are off the street, off the grid. And no one outside would ever know.